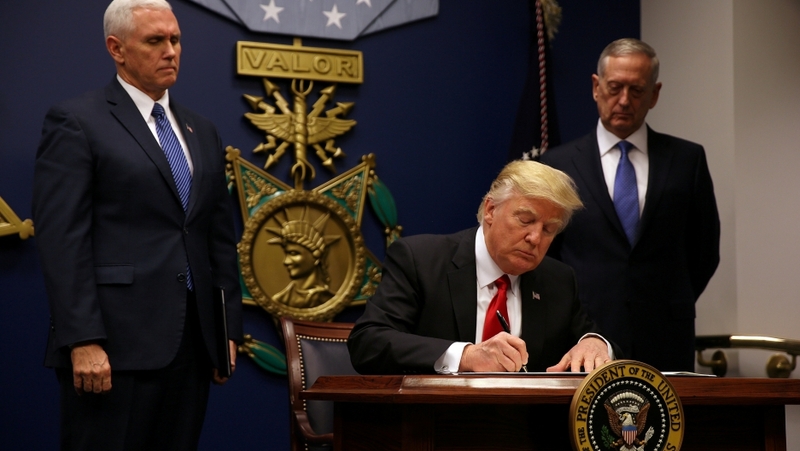 The federal court for the Eastern District of New York issued an emergency stay halting President Donald Trump’s executive order banning entry to the US from seven majority-Muslim countries tonight, following widespread protests at airports around the country. The court ruled on a habeas corpus petition filed by the ACLU on behalf of Hameed Khalid Darweesh and Sameer Abdulkhaleq Alshawi, who were denied entry to the US upon landing at JFK airport in New York City and detained indefinitely by Customs and Border Patrol. Darweesh spent a decade working for the United States military in Iraq as an interpreter and engineer and had been granted an entry visa after background checks; Alshawi had been granted a visa in order to join his wife and son who are already permanent residents of the US after their similar service with the US military. The court specifically ruled on Darweesh and Alshawi’s petition; other similarly-situated people being detained and those in transit are covered by the ruling, which is only temporary. But the point of a stay is to preserve the status quo while a permanent ruling is made — something the judge specifically reminded the lawyers for the goverment in the courtroom. And as the tweet from the National Immigration Law Center’s Jackie Vimo indicates above, the judge feels there is a likelihood of success on the merits for the case moving forward.